I finally got this in the mail from Amazon.com today. For those who don’t know who the J.B.’s are, they’re James Brown’s band, which makes them much more than just a mere band. 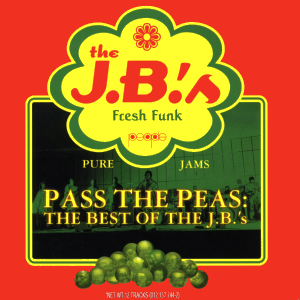 The J.B.’s are a funk force in their own right even when Mr. Please Please’s voice isn’t on the track. If you don’t believe me, check out the Amazon.com listing and listen to the previews. HOT DAMN! Now that’s funky. What I’ve always loved about James Brown’s music is that it feels like there’s a hundred things going on at once but it all manages to fit together. You could isolate one instrument by itself and even that alone would be twenty times funkier than anything on the pop charts. That’s what happens when you have people like Bobby Byrd, Fred Wesly, Maceo Parker, Bootsy Collins, Catfish Collins and tons of other talented people. I’m not any sort of true music critic, so I’m just going to ramble about how some of these songs make me feel. Blow Your Head – the ill synth in the beginning pops up in A LOT of Hip-Hop and brings a smile to my face every time I hear it. The rest of the song rolls in and grooves along with the synth playing around in the background. The Grunt, Pt. 1 – This song is like a runaway freight train that’s hauling TNT and funk. It starts with the horn that I used to call “the teapot noise” that we know and love from Public Enemy’s Rebel without a Pause and Night of the Living Baseheads. And the funk doesn’t let up until the song ends. If you like horn sections, this’ll be like honey for you. One of the main reasons that I bought this. Givin’ Up Food For Funk, Pt. 1 – And this song is one of the other main reasons that I bought this one. It’s almost the exact opposite of the Grunt because it’s more of a good, rolling groove solidly powered by guitars and keyboards with the horns being there for good flavor. If you’ve heard the Geto Boys’ Mind of a Lunatic, this is the beat. Same Beat, Pt. 1 – Okay, this is my new, official theme song for chillin’ out. This one is just completely laid back. Out of all the songs that I hadn’t heard yet, this is my favorite. It also ties the Gap Band’s Early in the Mornin’ for “Greatest Song with a Rooster in it”. Whether you’re a fan of soul music, James Brown or like to track down where a lot of Hip-Hop samples come from, I highly recommend this one. If you’re even just kinda-sorta-maybe thinking about getting it, just hurry up and get it now while it’s still $8. It usually hovers in the $12 to $14 range, although it’d still be worth it at that price. In other words, don’t let these peas pass you by. No, I couldn’t think of anything more clever than that.